A traditional flat light shelf system has many features that are desirable, but also many features that detract from overall performance, rendering many light shelf installations ineffective. BrightShelf® light shelf systems solve many of the challenges of traditional light shelf design. Traditional flat light shelves require a large amount of vertical daylighting window surface. This can be in upward of 3-4 feet in most cases. This can also cause the shelf to interfere with building occupants. BrightShelf® can be effectively installed as close as 16” to the ceiling. Reduced daylight window = Reduced heat gain. Window system cannot support heavy cantilever loads. 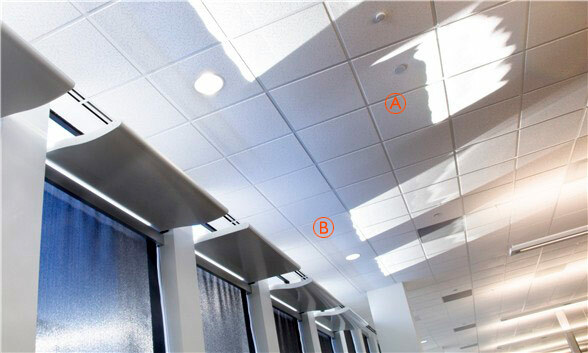 Reflected light is concentrated into “Hot Spot” on ceiling. 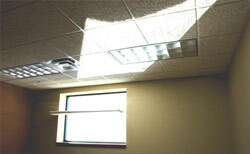 BrightShelf® ogee curve casts light in a variety of angles, double washing the ceiling with light. Light hitting the convex portion of the curve is thrown deep into the room, light hitting the concave portion is directed backward eliminating glare and coating the ceiling in a uniform pattern. Light travels 600% deeper into room than with traditional light shelves. The light shelf absorbs excessive heat. This makes it, and also the spaces around it, feel hot. 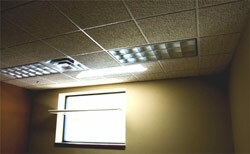 BrightShelf® utilizes a lighting sheet that reflects 98% of light. More reflectance not only increases light performance, it reflects heat gain and spreads it evenly into the space. Light shelf system, and windows, needs periodic cleaning that is often ignored due to difficulty reaching the top surface and daylighting window. BrightShelf® utilizes a rotational clip system that enables the light shelf to rotate downward, without the use of tools, for easy access to clean both the top surface of the shelf and the daylight window.